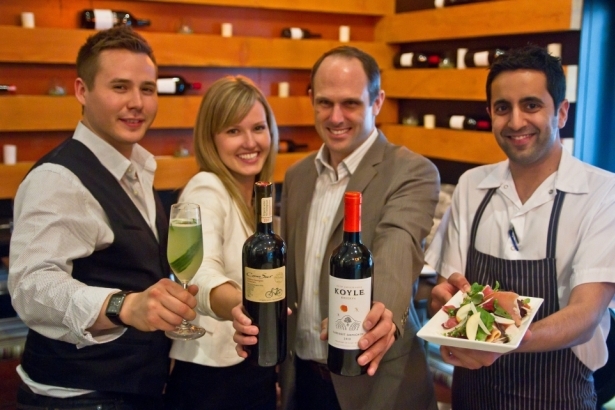 L-R: Ryan McDonald (Assistant Bar Manager, Uva Wine Bar), Alana Dickson (Account Manager, Wines of Chile), Steve Edwards (General Manager, Cibo Trattoria & Uva Wine Bar), Faizal Kassam (Executive Chef, Cibo Trattoria & Uva Wine Bar). You've probably heard the hype about an upcoming event with copious amounts of wine, delicious food, live music and a cocktail competition. It sounds terrible, I know. There are a plethora of other things that I'd rather do on a Thursday night, like laundry, painting my kitchen, resting up for Friday's work day, or slogging away at the gym. In case you are curious about what I'm talking about, the event is called Dish n Dazzle and it is an annual fundraiser put on by The BC Hospitality Foundation (BCHF). The event takes place on Thursday, May 30th and will be held at the Pan Pacific Hotel, at 999 Canada Place, from 6:30 to 9:30 PM. Last year the focus was on Argentinian wine , while this year the theme is Wines of Chile. Nineteen (19) wineries from across the country's wine regions will be paired with food from twelve (12) of Vancouver's best restaurants. This year the event showcases seven new restaurants and five returning restaurants from last year's event, including Café Pacifica, Pier 7 , ORU, PICA and Chef Ann Kirseböm. Last year, Chef Bob Wiles of Café Pacifica dished up Espresso-Crusted New York Striploin with a Chimichurri Infused Vegetable Carbonada Crispy Chichiron, while Chef Darren Brown of ORU combined a House-Made Chorizo and Chapa Bread with Heart of Palm and Jicama Salsa. Chef Dino Renaerts of Pier 7 and Chef Julian Bond (previously) of PICA, celebrated seafood by serving Halibut Ceviche with Mango and Avocado (Renaerts) and Dungeness Crab Salad with Albacore Tuna in a Sesame Cone with Sorrel Pesto (Bond). Chef Ann Kirseböm pleased the vegetarians in the group by preparing a Cranberry & Orange Confit with a Chevre, Blue Cheese Cracker. I can't wait to see what they've concocted for this year's event and am eager to see what the others are creating as well! "We are thrilled to bring this signature food, wine, and cocktail event back to Vancouver for the fourth year in a row. The support from Wines of Chile has been incredible. I can't wait for our guests to taste these wines with food supplied from some of BC's most talented chefs. This will truly be a night to remember." Tickets for the event are $75 +tax, and are on sale now at www.eply.com/DishNDazzle2013. Only 400 tickets are being sold for the event and the days are counting down, so get one while you can! All proceeds from ticket sales, a silent auction and a raffle, support BCHF in providing financial aide for hospitality industry members. In addition to offering scholarships for hospitality and culinary students the BCHF also subsidizes some of the exorbitant medical expenses they incur due to lack of benefit packages through their jobs. For more information on the BCHF visit www.bchospitalityfoundation.com or send them a tweet @BCHospitality.